R. Stevie Moore is a great music artist that more people should know about. He's commonly called the "Unsung Father of Lo-Fi" and a "DIY Pioneer and Musical Genius." And, he's also infamous for being "criminally neglected by the American recording industry for the last 30 years" and for living "in near-poverty, still creating his very original music and selling it directly through his website." I often reference R. Stevie as a litmus test that shows how "taste makers" (e.g., the old record label ideals) fail—basically, it's so much easier for so-called "taste makers" to focus on good music that has fast popular appeal, that they fail to tell people enough about other great music (i.e., music that doesn't rise to rapid popularity, and so is left to fall by the wayside). Anyway, I am a total R. Stevie fan, but I have to admit that I've just scratched the surface of his catalog of recordings—there are a lot of them. So, I am very excited to find that YouTube user autosam (maybe R. Stevie himself?) has posted more than 120 R. Stevie Moore music videos. This is just an awesome way to explore his music. Partially unrelated, there's a new online playlist service called MixTube that works based on YouTube videos. To get a sense for how it works, I made a playlist of 120+ R. Stevie Moore songs. I am listening to this right now—it's a lot more natural for me to listen to music then to watch videos (though I want to watch them too, as they are cool videos!). I am definitely going to buy a bunch more R. Stevie Moore CDs, and I hope you'll do the same—they're all available for sale on the great R. Stevie Moore website. The past couple weeks, I've been posting less because I am working on a pretty big upgrade to the site. The new music player is the big new feature. It's been hard to make it do what I want, but I am getting pretty close. So, maybe within the week. The first new music up will definitely be tracks from Err or Man. I know this is especially important for the few of my slacker friends who are excited to hear the music, but can't seem to ever remember to just go and buy the CD / Book version (buy it now at CD Baby!). Of course, getting new people turned-on to the music is the intent, so whatever it takes. If you're here now, and the music isn't up on the site yet, I hope you'll come back and check it out—soon! I haven't thought about Richard Wright in a long time. He died today, and it reminded me that I used to listen to Pink Floyd a lot as a kid—around the time I was first becoming a keyboardist. Wright is someone whose playing I really listened to when I first was learning how to listen. That's Pink Floyd's Careful with That Axe, Eugene, performed live at Pompeii. Being distracted by words right now. I periodically find myself deeply distracted in the enjoyment of Michael Quinion's World Wide Words website. So, I thought I'd pick a good, music-related entry to highlight. And, I found this one: play it by ear — which I like to do, personally. I think that entry is quite copacetic, but you may find some others are even funner. From a list of 50 great art videos on YouTube, a couple highlights. I've started working my way through this list posted on the Guardian, The 50 greatest arts videos on YouTube. It's a hard list in three respects: 1) many of the videos are so great that you'll waste your whole day watching them, 2) some of these great videos then cross-reference other great videos (thus, even more of your day gone), and 3) some of the videos are pretty boring (it may be great that they exist, but they're not that great to actually watch). The list includes the classic 1961 film of John Coltrane playing "My Favorite Things" on German TV. I remember seeing this in some larger film about Coltrane. The whole German TV concert / broadcast is also notable because Eric Dolphy is part of the group. 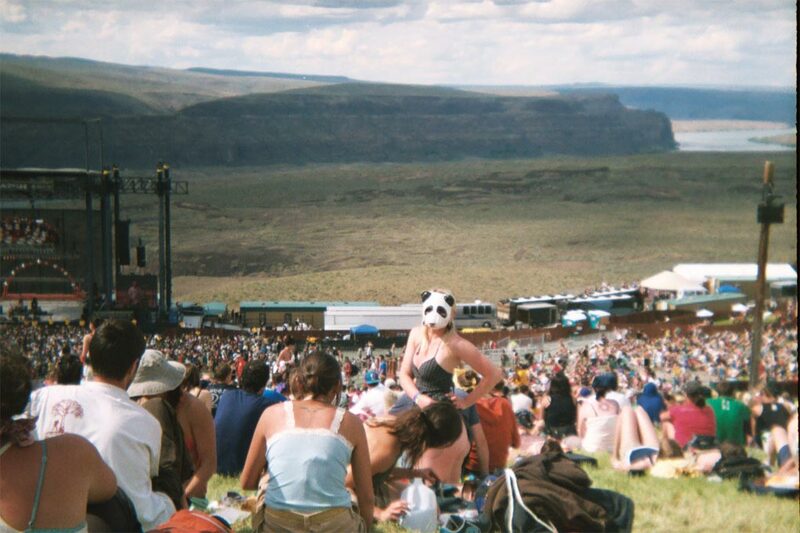 Sasquatch Crowd Panda Girl (May 26, 2008). I'm about to start posting photos, as another step in the evolution of Wrong Notes. Since 2003, I've been working on a series of photos titled Crowd Culture, that have always been associated with the Ear Reverends' music. So, images from Crowd Culture will definitely appear here. Besides my own photos, we also can look forward to seeing photos from others when Wrong Notes transitions to being a group blog!